Mixed news with today's fertilization report. Of the eleven eggs retrieved, only four were mature. This, obviously, is an enormous disappointment. However, three of the four fertilized and were looking good at the four-cell stage as of this morning. I will get a call early tomorrow regarding whether we will transfer then or wait it out until Tuesday. I asked whether it's possible to have all three transferred since I am now over 35 by a whole nine days. I'm guessing the doctor will say no if they all (hopefully!) look stellar and maybe yes if they don't. Please pray that at least two of them will be perfect for transfer! 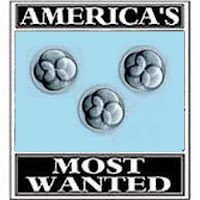 These little embryos are among America's most wanted and I would love nothing more than to sentence one or two of them to nine months on the inside. No, these aren't them. This is just a sloppy Photoshop job. Update﻿: As of Sunday morning, all three are still growing strong. We're shooting for a Day 5 transfer on Tuesday! Two out of four can totally happen! This is still looking good! Just sent up a prayer for you that you will meet the children in that dish! Love your most wanted analogy, and believing all good things for you. The holiday season is upon us and its a time for miracles! they definitely are some of America's most wanted. They won't escape this time. Best of luck! Thinking of you! Sending lots of good vibes for strong embies!!! Praying!!! Sweet little embies, grow strong strong strong!! Love the "Wanted" poster! 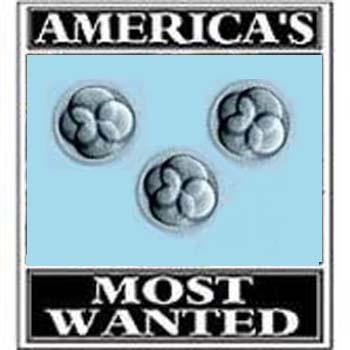 It's obvious how wanted these little embryos are. I wish them and you strength. Hope your embryos continue to do well! Good luck on Tuesday, I'll be crossing my fingers for you! I hope that all continues to go well for you and that Tuesday goes perfectly! Even though I know it was initially disappointing (and frustrating, if you are like me...when I wondered why the heck I was able to get a decent number of follicles but they weren't anywhere near as mature as everyone thought--even with out the roof estrogen levels and such...but I digress....), HOORAY for those little ones going strong!!!!! I asked my RE about transferring 3 (we didn't have 3 to transfer, actually, but when we thought we might, I broached the subject) because I was 37 and obviously had a 'hostile egg' situation and wanted to just do whatever I could to ensure I'd get pregnant. I was told that according to the new guidelines set by the SART, and thanks to Octomom situations (and honestly, rightly so, I guess, but those who won't follow won't follow regardless of the recommendation! ), my outcome was considered favorable and the recommendation was to transfer 2 vice 3. I nearly choked as they told me that I was considered a 'favorable' scenario...so I wonder if your 2 fewer years would be incorporated and make you such as well. After finding out we were pregnant again, and having a record of getting pregnant from both fresh cycles attempted, I was told I was an RE's dream. Praying for those sweet little embryos and hoping that tomorrow is an amazing and fabulous transfer...so behind in blogs with all the holiday/baby/Matthew stuff going on, but will DEFINITELY stalk for updates!! !